In high school, I was friends with a girl that was on our lacrosse team. She was very funny and always had these interesting theories about life and usually, boys. She said to be wary of any guy whose favorite type of bagel is “plain.” She claimed that any guy (or anyone, I guess) that preferred plain, “flavorless” bagels has to be boring and not worth the time. Now, I don’t not like plain bagels, but it’s definitely not my go-to. My favorite bagel flavor of all-time is the Everything. 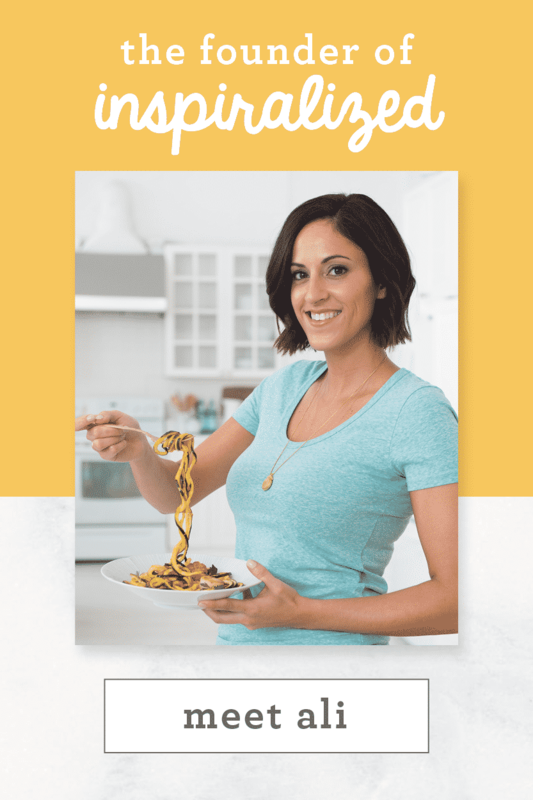 In my first cookbook, I even made the “Everything Bagel Bun,” which is still one of my absolute favorite recipes from the book, that I make on the weekends, smeared with some avocado or vegan butter. It’s incredible, seriously! Now, as you know (or should know! 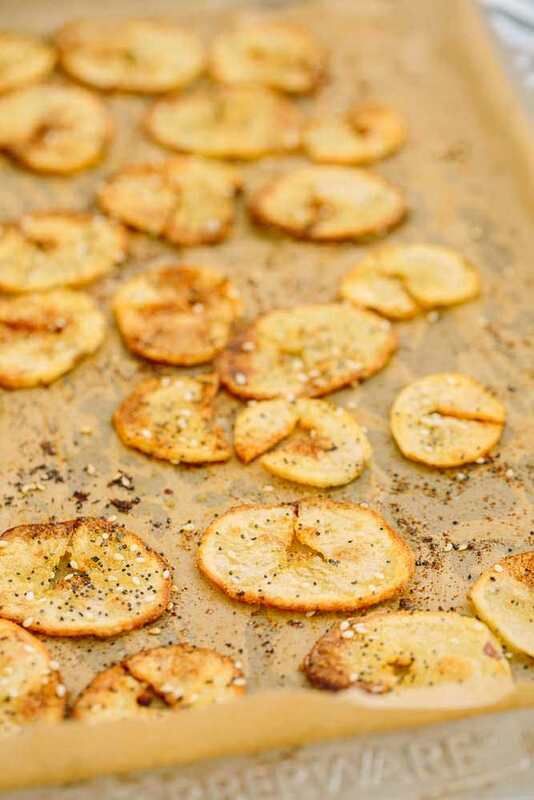 ), the Inspiralizer can also make chip slices, perfect for making crispy, uniformly sized chips! 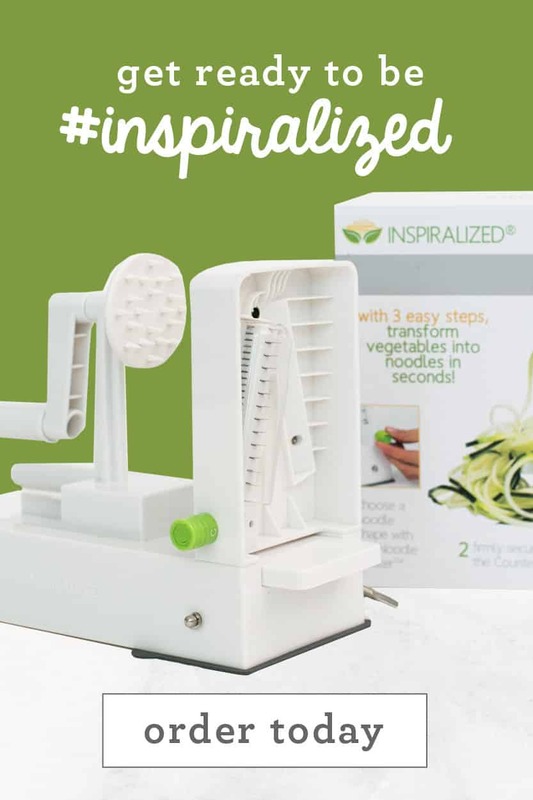 Instead of painstakingly slicing with a mandolin, just load the potato on the Inspiralizer and spiralize away. These chips are perfetly crispy! 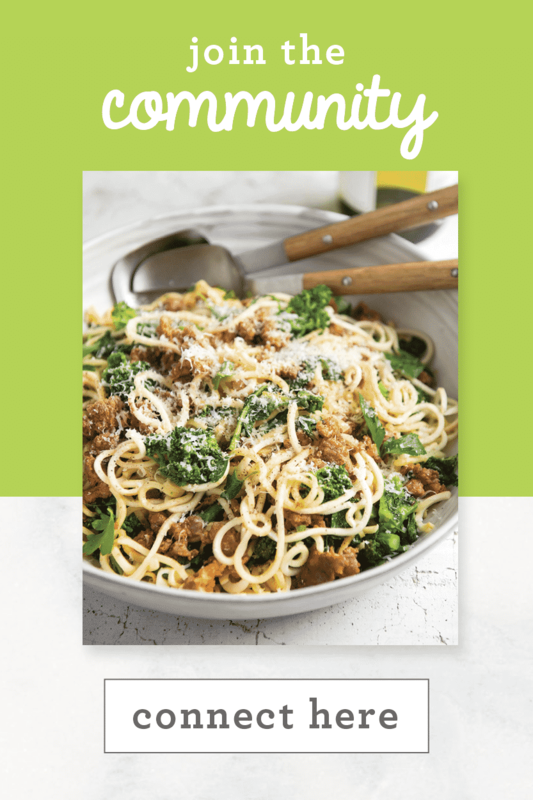 However, there’s a trick – as the recipe indicates, you MUST cook them carefully. Watch the chips as they cook, don’t just pop them in the oven and leave them there – they’ll burn or cook unevenly. After cooking for 15 minutes, check every two minutes, picking out the pieces that are already cooked fully, until all the chips are evenly cooked. 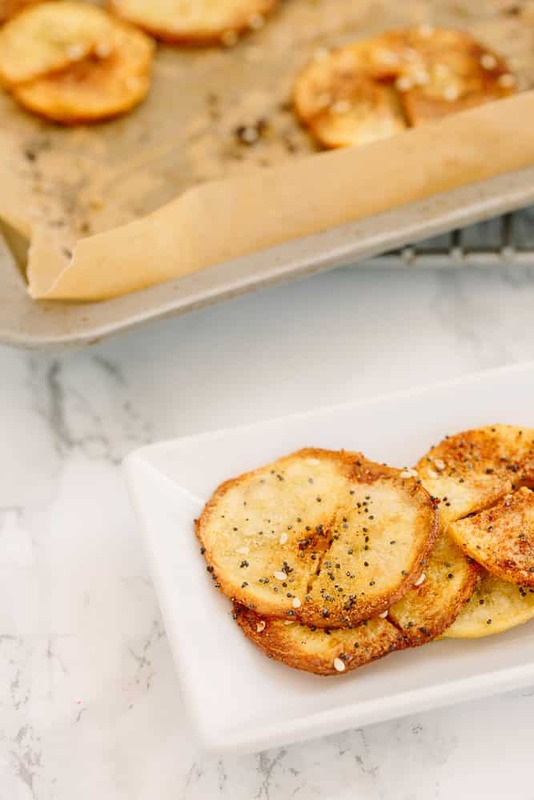 And keep in mind – after you take the chips out of the oven, they will crisp up, so if they seem a little floppy but they’re fully golden brown, they’ll crisp up in 5 minutes out of the oven. PLEASE NOTE: Currently, I am celebrating my one year wedding anniversary with my husband, in Southeast Asia. Thus, I am not checking blog comments and messages. 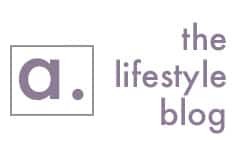 If you do leave a comment, Meaghan, our Brand & Community Manager is here to respond and help with any questions. You can always e-mail her if you need anything while I’m gone. I return July 4th weekend, and will respond to everything that week when I’m back in the office. Thank you for your patience and understanding as I enjoy this time with my husband! In a bowl, mix together the ingredients for the everything bagel seasoning. Combine well and set aside. Slice the potatoes halfway through lengthwise, careful not to pierce the center. 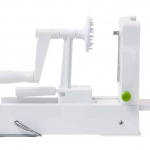 Spiralize the potatoes on Blade A to make the chip slices. Lay the spiralized potatoes out on the parchment paper. 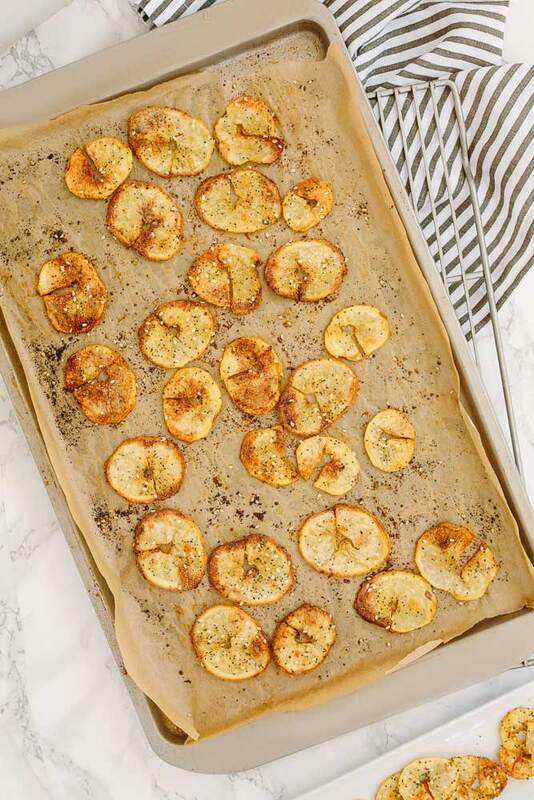 If needed, line another baking sheet to accommodate all the slices – do not overlap potatoes. Place the olive oil in a small bowl and using a brush, brush the slices with three-quarters of the olive oil. Sprinkle over evenly with three-quarters of the every bagel seasoning. Bake in the oven for 15 minutes, flip over, brush with remaining olive oil and season with remaining seasoning. Place the chips back into the oven and cook another 7-10 minutes, checking every 2-3 minutes to make sure the chips don’t burn. If they begin to burn, remove the ones that are burning and place the others back in the oven. Let rest for 5 minutes to fully crisp up before serving. Everything bagels beat out plain every day of the week! I love the idea of using those flavors on a chip. Brilliant! Couldn't agree more! Thanks, Erin! Love to hear this! Let us know how it goes, Kelly! 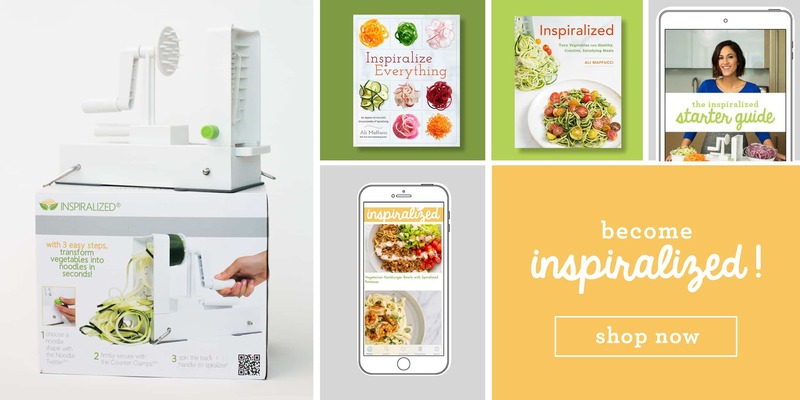 It's so much easier to make chips using the Inspiralizer! And a lot safer!! Save those fingers! So clever!!! I was so excited to see you make these on Snapchat. 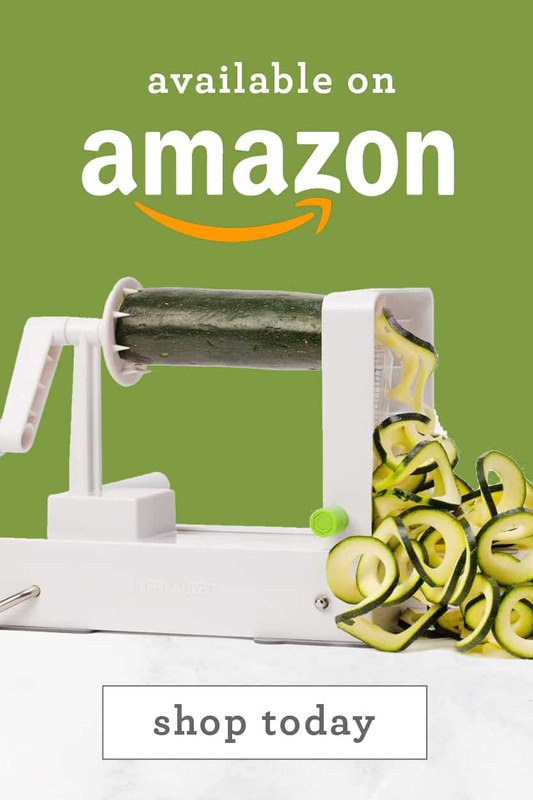 No more annoying slicing! So true! 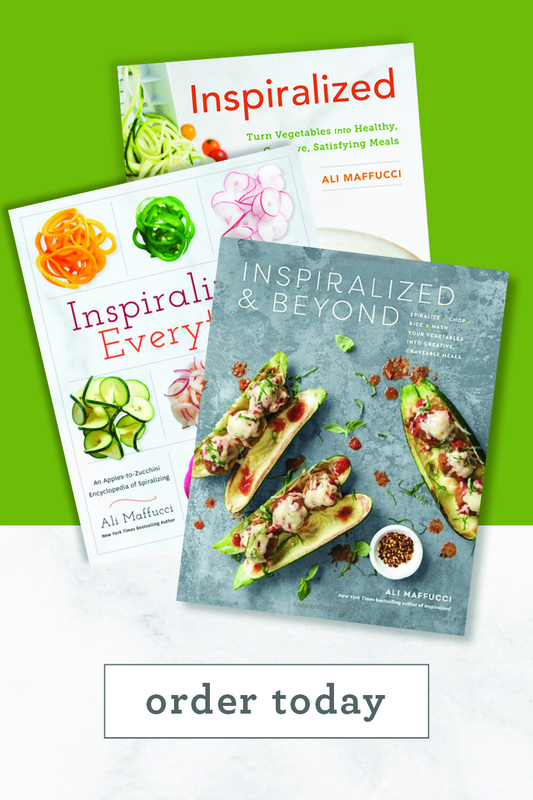 We're happy you'll be able to enjoy these! It's a great snack. These chips sound delicious! 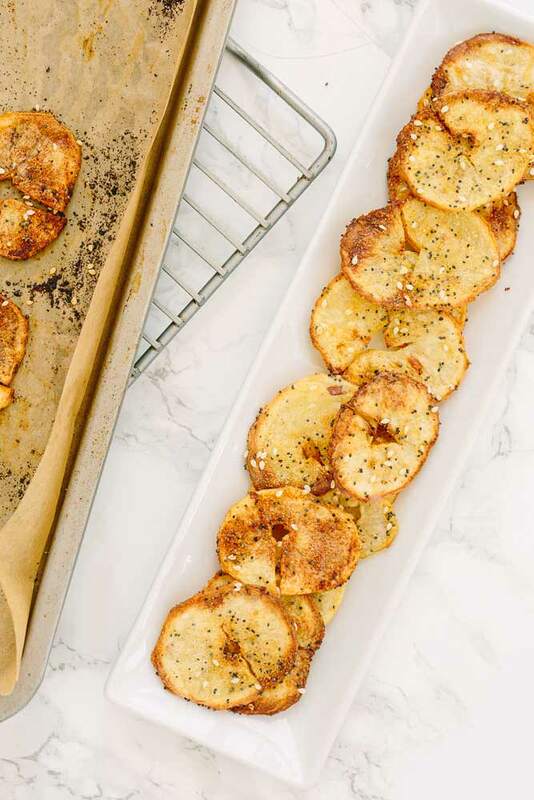 Do you think you can make plantain chips the same way? I had some in NYC at a restaurant called Empanada Mama, and now I am hooked! You can make all types of chips using this method! Give it a shot - just keep an eye when you're baking. Different veggies and fruit will crisp up quicker or slower than others. Awesome to hear! Thank you for letting us know. These are AMAZING!! I had to wait til the weather in Cali cooled a bit before I could think of heating my oven but these were worth the wait! I made a purple tweaks to make the recipe easier to make in a larger batch for my family. I doubled the recipe. Put potato slices in a large bowl and tossed with half of the amount of olive oil (1/2 the fat!! No less taste) and tossed the seasoning on then put on baking sheets with silpat mats on them. Perfect! Tossing the potatoes saved me a lot of time rather than brushing on the oil for such a large batch. I was initially concerned that doing it that way would burn or over lol the seeds, but it did not. I also cooked them on convection mode at 400 with 3 trays. Perfect! I'm such a goof! 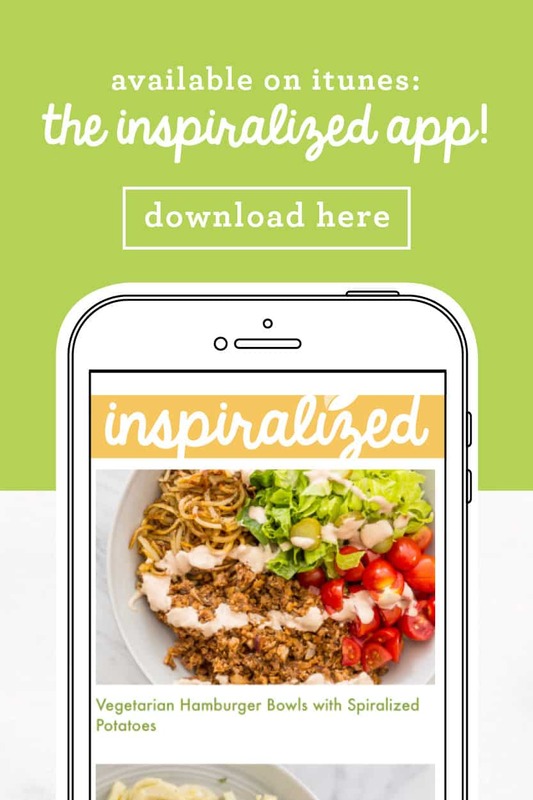 I saw this and got excited (because I love Everything Bagels) and then very confused ... how would the bagel fit on the Inspiralizerl? Luckily I kept reading and will be trying this over the weekend. Thank you for all the good ideas!